Pyreus Kril was a Nova Corpsman before volunteering to fill the role of Herald of Galactus. With his fire-welding powers, Firelord was formidible member of the resistance against the Annihilation Wave. Seriously? The guy who got the fire powers was named "Pyreus"? A bit on the nose, don't you think? It would be like if Terrax's real name was "Stony O'Houlihan," or Silver Surfer was "Tidal-Forces Jones." Talk about your nominative determinism! 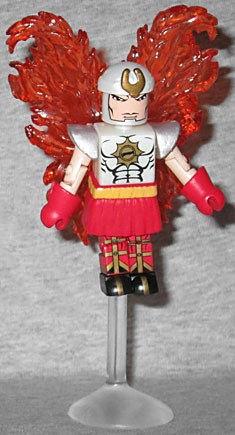 Firelord was Galacts' third herald, and wears a '70s-tastic yellow costume and red boots over his orange skin. See, because he's like fire! His chest and face are painted a different color than his limbs, for some reason. He has new fiery hair, an orange "exhaust cloud" flight stand, and his giant flaming Q-Tip double-ended fire staff. It's molded from a very soft material, so he has trouble holding it. Gabriel Lan served with Pyreus Kril as a Nova Corpsman before being abducted by Galactus and made a Herald. When he was killed by the Ovoids, Lan's soul was placed inside a robot body. If the original idea behind Galactus was "the Fantastic Four fight God," then Airwalker takes that analogy to extremes: he is clearly just an angel. He's wearing an armored breastplate, a skirt, big gloves, and armored bands on his legs, making him look like a Roman legionaire - and of course, he has giant flaming wings on his back. You'd think that would make him more of a "fire flier" than an "air walker," but such is the crazy mixed-up world of comicbooks. His cap is new, with a tuning fork on the forehead, and there's a single-foot hover stand so he can lift off from the ground (though the fit in his foot is quite loose). Marvel Minimates TRU Series 15 is another series where all the figures were exclusives, but only half of them were marked, which is frustrating. On the other hand, all the sets were also intended to complete or complement existing releases, which is fun: in this case, Firelord and Air-Walker were the leftover options from the Heralds of Galactus box set vote (and yet were much easier to find). An Xmas gift for you!